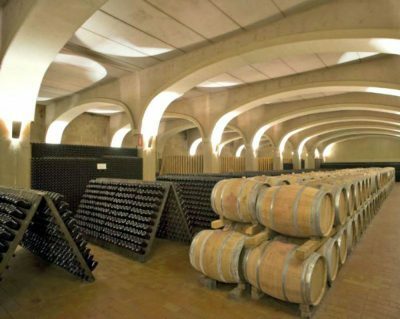 Colonnara is a 110-member co-operative winery located in the heart of the Verdicchio Castelli di Jesi DOC, in Cupramontana. It’s some 40km inland from the city of Ancona and 20km from the town of Jesi. Colonnara was established in 1959 by 19 growers; it now makes many different wines from around the March; there are whites, reds and fizz. These days, I enjoy visiting co-operatives, whether in Italy or Spain and France. For most, their reputation for making poor quality wine is now far in the past. That reputation unfortunately still lingers amongst the unenlightened but is only rarely justified. No longer are growers paid by the sheer weight of grapes, a system that rewards quantity rather than quality. Nor can co-ops rely on subsidies these days either. Instead, most have undergone a silent quality revolution. The best cooperatives have guaranteed access to the best growers grapes. Highly qualified agronomists ensure that each grower meets quality standards. In turn, the growers now receive quality incentives based on a range of scientific tests measuring grape quality. All this has led to a massive leap forward. In short, co-ops are now excellent sources of quality wine at fair prices. Also, co-operatives fulfil a vital social, economic and community function as well as underpinning much of the wine industry. For example, 60% of Italian wine is from co-ops! Co-ops are mutual, owned by the members that combine their resources. Consequently, it means they can invest in wine-making, technology, ongoing research, bottling and branding. The economies of scale derived from such fragmented underlying ownership enable them to compete with privately owned wine companies. They can export to overseas markets and reduce their production costs while offering a diverse range as well. It’s a business model that can serve both small winegrowers and consumers well. Meanwhile, the top wines are from a selection of the best growers. Many are outstanding. Meanwhile, I believe co-operatives don’t get the attention they deserve and remain sadly invisible to many. Finally, all this means that a co-operative should be the first stop in an unfamiliar wine region. While lacking the glamour and reputation of a top estate, they are perfect for discovering an area under one roof. There’s usually a shop where you can often try before you buy. That’s ideal for a holiday and fun too, especially for those daunted by the prospect of making winery visits. All you have to do is turn up. So I turned up at Colonnara. As mentioned above, Colonarra has 110 growers. As they have 120 hectares of vineyards, located across the Marche, the individual grower holdings are tiny. Despite this, the vines are all in organic conversion too. Indeed, they are well on the way to becoming a Cantina Verde. Presently, about 50% of the growers are organically certified, with the rest to follow. Except for the ubiquitous vino sfuso, dispensed via “petrol-pumps” for local consumption, there are no bulk wines. The rest makes one million bottles each year, of which nearly 25% is sparkling. Colonnara is known for its Verdicchio dei Castelli di Jesi. However, the selection below also includes some of their red wines to check out. All are available in the UK. There are more than a dozen more available at their winery. The UK importer is Alivini, (minimum order six mixed bottles) and they are also sold in the UK by GP Brands. Retail prices include VAT. A visit comes highly recommended for those fortunate to visit the Marche, where the prices are, of course, much lower. Cuprese is a blend of their best Verdicchio, chosen from several growers located around the DOC Classico. Typical fennel and white flowers on the nose, mineral freshness and pear fruit. A vertical tasting of superb older bottles from 2003 and 1988 shows longevity; the wine takes on an increasingly honey and butter character. Alivini, £12.34; GP Brands £14.38. Cuprese is in my recent Verdicchio dei Castelli di Jesi article. As for Colonnara, they seem to be one big happy family. VerdicchiAMO, you might say.